The African Art collection spans about 2,500 years and showcases historically significant works in a variety of materials that display the talent and extraordinary craftsmanship of Africa’s artists, past and present. The Nelson-Atkins began collecting African art in the 1930s, with many notable acquisitions including two 17th-century cast brass objects from the Benin Kingdom in Nigeria in 1958. While the collection grew slowly until 1983, subsequent years saw more aggressive acquisitions. Today the collection exceeds 400 objects and boasts several historically important works rendered in a variety of materials such as wood, brass, bead, terracotta, ivory and natural fibers. Represented are sculptures, ceramics, textiles, headdresses and bodily ornaments from more than 30 of the continent’s artistic cultures from western, central and southern Africa. The African collection is displayed in the Bloch Building in Gallery L9. Videos and photographs introduce African culture and add context, showing visitors how objects are used in ceremonies or everyday life. 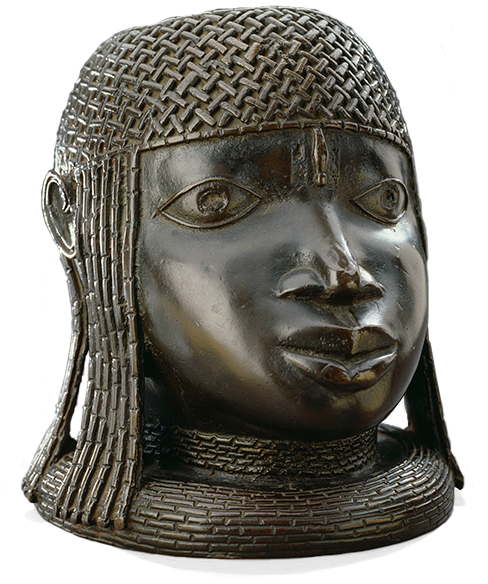 Commemorative Head of an Oba, Nigeria, 16th century. Commemorative Head of an Oba, Nigeria, Benin Kingdom, 16th century. Brass, height: 9 1/8 inches. Purchase: William Rockhill Nelson Trust through the generosity of Donald J. and Adele C. Hall, Mr. and Mrs. Herman Robert Sutherland, and an anonymous donor; The Nelson Gallery Foundation; and the exchange of a Trust property, 87-7. 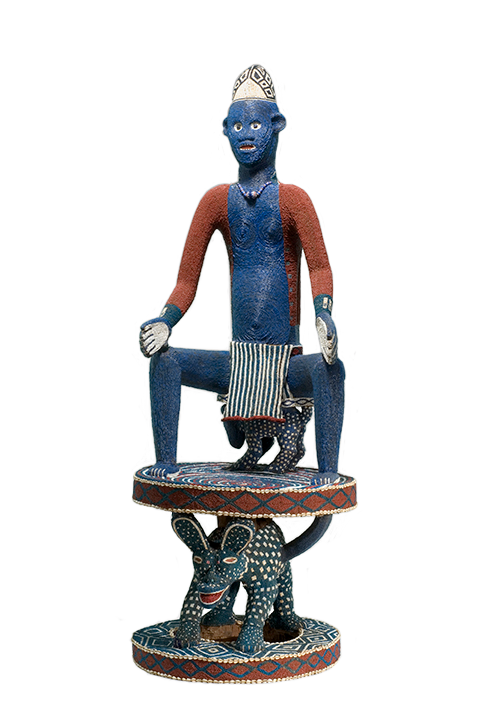 Reliquary Guardian Figure, Gabon, 19th century. 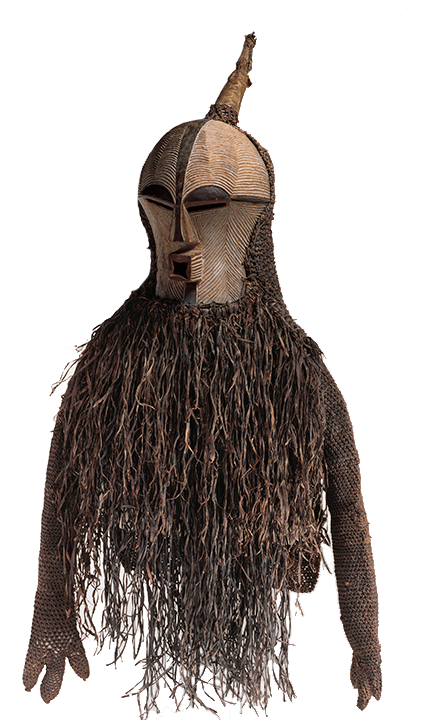 Reliquary Guardian Figure (Mbulu Ngulu or Mbulu Viti), Gabon, Kota people, 19th century. Wood, copper, copper alloy, and iron, 24 7/8 x 16 x 3 inches. Purchase: William Rockhill Nelson Trust through the George H. and Elizabeth O. Davis Fund, 99-20. 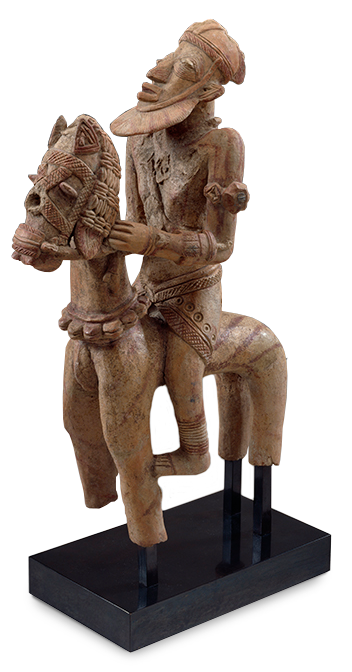 Horse and Rider, Mali, 12th-16th century. Horse and Rider, Mali, Djenne, 12th-16th century. Earthenware and pigment, 21 x 11 x 6 inches. Purchase: William Rockhill Nelson Trust through the George H. and Elizabeth O. Davis Fund and the generosity of Shirley and Barnett Helzberg, 2000.31. Shrine Figure Headdress, Guinea, 19th century. Shrine Figure Headdress, Guinea, Baga people, 19th century. Wood and brass-coated ferrous tacks, 20 7/8 x 26 3/4 inches. Purchase: William Rockhill Nelson Trust through the George H. and Elizabeth O. Davis Fund, 2003.17. 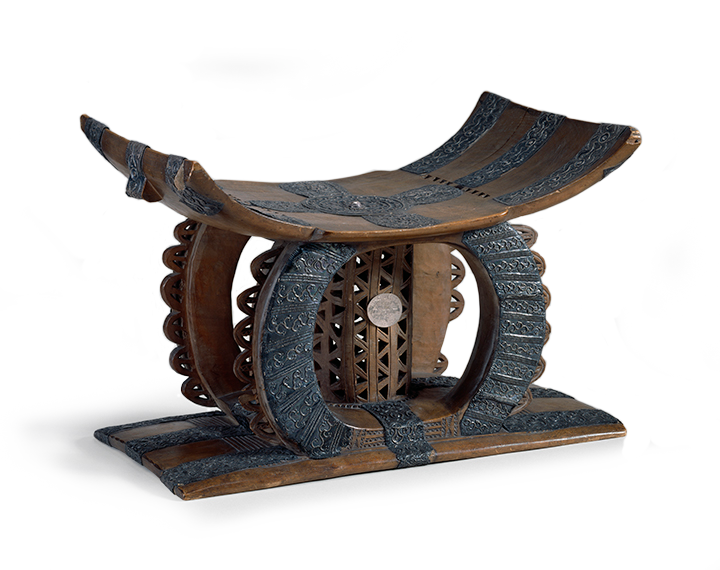 Throne, Bamileke Chiefdom, Bansoa, Cameroon, 19th century. Wood, glass beads, shells, and fiber, 71 x 26 1/2 x 26 inches. Purchase: William Rockhill Nelson Trust through the George H. and Elizabeth O. Davis Fund, 92-13. 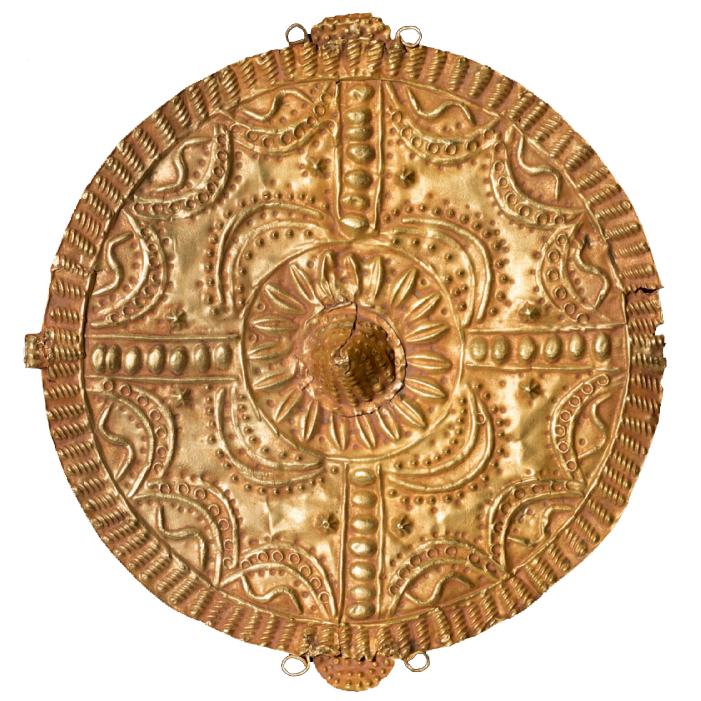 Soul washer’s badge, Ghana, 19th century. 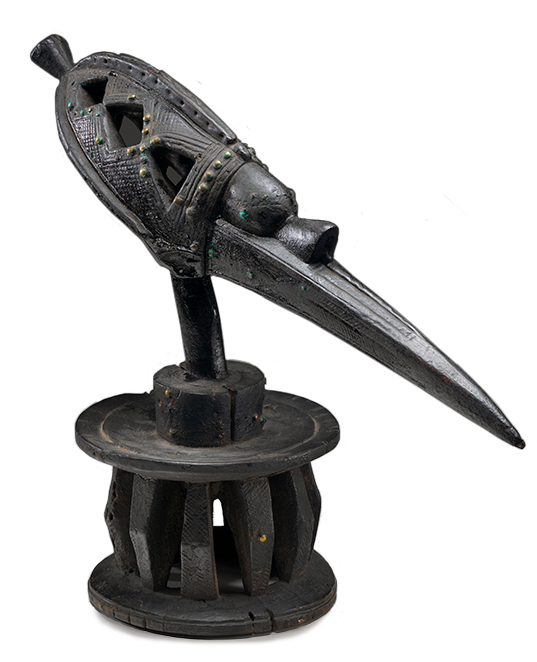 Soul washer’s badge, Ghana, Akan, Asante people, 19th century. Gold, diam: 4 7/8 inches. Purchase: acquired through the generosity of Delores De Wilde Bina and Robert F. Bina, in honor of Barbara G. Head, 2013.48.2. 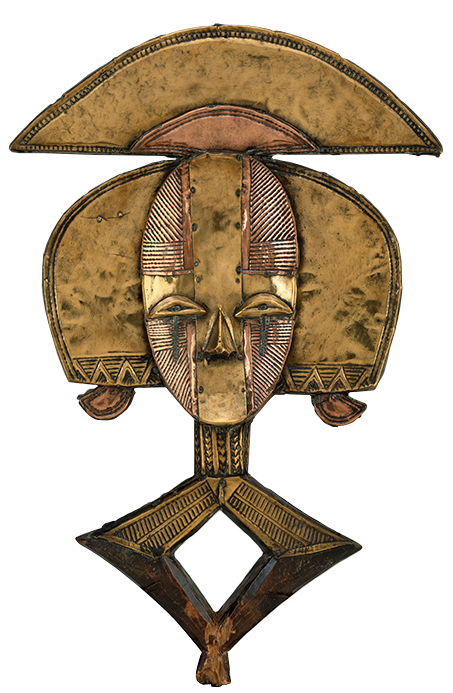 Mask of the Bwadi bwa Kifwebe Society, Democratic Republic of Congo, late 19th century. Mask of the Bwadi bwa Kifwebe Society, Democratic Republic of Congo, Songye people, late 19th century. Wood, pigment, fiber, hide, and shell, 4 feet 6 1/2 inches x 28 1/2 inches. Purchase: William Rockhill Nelson Trust through the George H. and Elizabeth O. Davis Fund, 92-18. Door from Shrine for Deity Shango, Nigeria, 19th century. Door from Shrine for Deity Shango, Nigeria, Yoruba people, 19th century. Wood and metal, 4 feet 4 inches x 19 3/8 inches x 1 5/8 inches. Purchase: William Rockhill Nelson Trust through the Esther Clark Garnett Fund and the George H. and Elizabeth O. Davis Fund, 98-11. Royal Stool, Ghana, ca. 1860. Royal Stool, Ghana, Asante people, ca. 1860. Wood and silver, 14 15/16 x 23 1/2 x 13 1/4 inches. Purchase: William Rockhill Nelson Trust, 65-5. Male Shrine Figure, Nigeria, early 20th century. Male Shrine Figure, Nigeria, Urhobo people, early 20th century. Wood and pigment, 49 inches. Purchase: William Rockhill Nelson Trust through the George H. and Elizabeth O. Davis Fund, 86-7.